In 1925 Chen Pei-Ken, Koo Hsien-Jung and others advocated reconstructing the Taipei Confucius Temple at Da Long Tong, the layout and configuration of which was based on the traditional Confucian temple to project its ritual construction. The main compound along the axial line was planned to be constructed on a magnificent scale, from the south to the north in sequence as Wanren Gongqiang, Pan Pond, Lingxing Gate, Yi Gate, Dacheng Hall, and Chongsheng Shrine; the east wing and the east warehouse, and the west ?conclude? including the west wing and the west warehouse. Minglun Hall was to be built in front of a vacant lot on the left, and the Zhu Zi Shrine to be constructed behind the lot where tablets of Zhu Zi and the Literary God would be consecrated upstairs, and the library located downstairs. Jian Wu Temple was to be built in the vacant lot on the right to offer sacrifice to Guan-gong (the Martial God), and the soaring Gui-lou (building) would be constructed to consecrate the Gui-xin (Literary God). There was a precedent for building a temple consecrate to both martial and literary gods, and constructing the Zhu Zi Shrine and the Taoist Gui-lou. 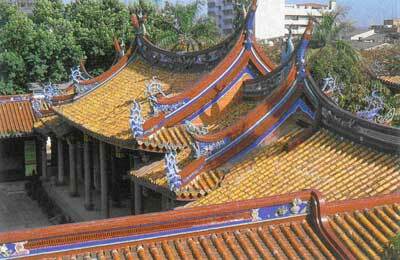 Tainan Confucius Temple is the earliest and largest one in Taiwan, containing the Minglun Hall, Zhu Zi Shrine, and Literary God Temple. In the early stages of building the Taipei Confucius Temple, four buildings on the two sides could not be built due to lack of funds. The original blueprint was designed by famous craftsman Wang Yi-shun, but the Green-Cloud Wall and Dismount Stele outside the Wanrengong Wall have never been achieved. The vacant land on the east of Confucius's Temple was originally to be used for constructing the Minglun Hall and Zhu Zi Shrine, and the one on the west, after restoration of Taiwan, was occupied by a modern concrete building---the Minglun Hall mainly used for studying and artistic activities such as assemblies, lectures, scripture readings and calligraphy.